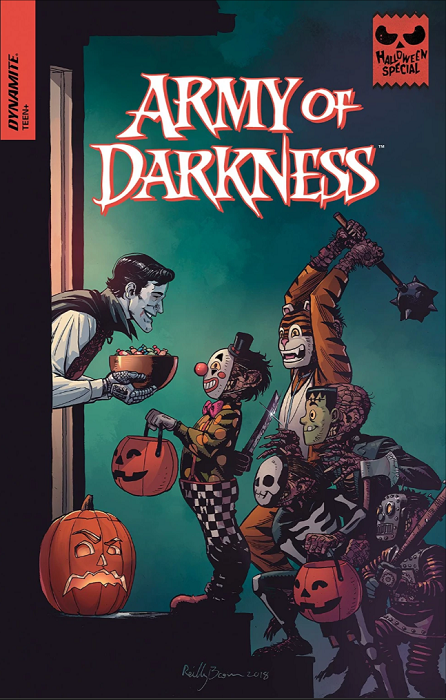 Halloween and Army of Darkness are like peanut butter and jelly, Frankenstein and his bride. They’re made for each other. Ash’s brash attitude and the horde of creepy-crawlies trailing in his wake (or chasing him flat-out, as the case may be) make for the perfect fright night combination. “Scared Shipless” centers Ash firmly in 2018. He’s come to the Charleston waterfront for a hot date he set up through a Tinder-style dating app. 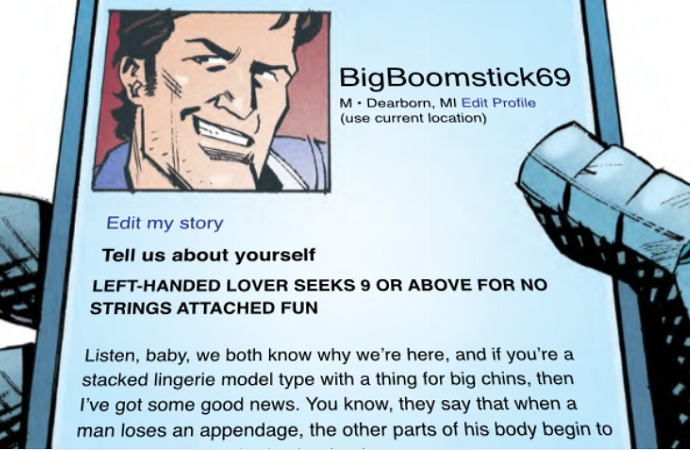 His profile absolutely looks exactly as you would expect, full of braggadocio, innuendo, and chin. Ash might be the definition of “that guy,” and you wonder who in the world swiped right without an intense Jay Leno fetish. 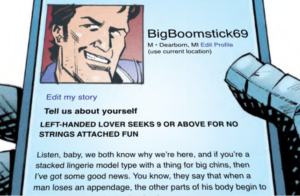 Unfortunately, for Ash (but fortunately for my faith in humanity), no one’s tastes have been impugned here, because everyone’s favorite chainsaw-handed hero has been catfished. Even better, his “date” turns out to be Teddy the tour guide, intent on exploiting Ash to summon back Blackbeard and his long-dead crew, and using pictures of his coworker and fellow guide Jenny to do it. But when the pirates sail back to life and into the harbor, bringing chaos to Charleston, Jenny rises to the occasion magnificently, “roundest, softest pair of big, beautiful […] eyes,” and all. She’s delightful, reminding ghosts and men alike that she’s far more than a tour guide; she loves the historic district, and she’s on board with stopping evil in its tracks. Oh, and she’s a deft hand behind the wheel and with a shotgun, too. Jenny is a decided contrast to Rachel, goth girl extraordinaire who goes in search of spiritual protection in “Cemetery Man” and finds it in a chicken foot she purchases from the bored proprietor of a local New Age shop. While her attitude is pure Daria, Rachel’s take on action in the face of strange happenings is rather more Snow White. Sure, she warns her friends that perhaps attempting to speak to spirits in a graveyard on Halloween isn’t the best idea. But when she’s proven right, she spends all her time clutching her chicken foot and wishing for someone to save her rather than saving herself. The art in both stories really makes them pop. Blackbeard’s ship has sails made of human skins stitched together, reminiscent of the Necronomicon itself, and the cannons fire not iron balls but flaming skulls. Rachel’s friends morph from run-of-the-mill college kids into red-eyed, skeletal animals, shambling through a graveyard lit with an eerie blue glow. Eoin Marron plays up Ash’s chin, while Sam Lotfi celebrates the gore, as Ash guzzles beer in a face splattered with ghoulish co-ed blood. Taylor Esposito’s lettering heightens the effect, contrasting the white speech balloons of human characters with creepy black ones for those returned to grisly half-life by the Necronomicon. It’s all delightfully ghoulish. When it comes to spooky stories with a side of camp, there’s nothing better than a return to the universe where three small words have the ability to turn the world topsy-turvy. Ash delivers raunchy one-liners and severed heads with equal ease. 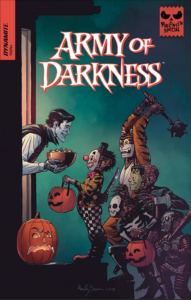 For a quick, eerie read this October 31st, Army of Darkness hits the spot.